Chairman Bill Cobey says the board will meet at least once more before the year’s out to consider their legal response to House Bill 17, Republican-drafted legislation that, among numerous cuts to the powers of Democratic Gov.-elect Roy Cooper, also reshuffles the duties of the state board. Under the legislation, which was signed into law by Gov. Pat McCrory Monday, newly-elected Republican Superintendent of Public Instruction Mark Johnson will take over multiple powers from the board, including administration of the state’s charter school oversight office and hiring and firing powers for numerous personnel positions in the Department of Public Instruction. Johnson would also be able to appoint a leader for the controversial new “achievement school district,” a GOP-championed reform passed this year that could turn over control of a few low-performing schools to for-profit charter operators. 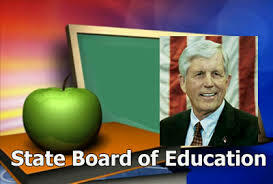 Johnson applauded the news, but leaders in the Republican-controlled State Board of Education were not pleased. “Today, the State Board of Education directed its attorneys to continue to analyze House Bill 17 and review the constitutional implications of the legislation,” Cobey said in a statement. After meeting for roughly two hours in closed session with their lawyers, board members were tight-lipped about the official response Tuesday, although Cobey told Policy Watch this week that he believes most of the law’s actions pertaining to his board are unconstitutional. Check back with Policy Watch for details on the new state board meeting as they become available.